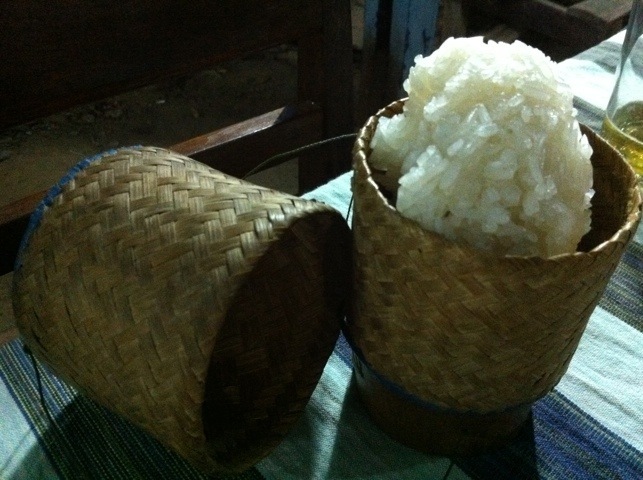 Sticky rice is a staple in Laos, served up in woven bamboo baskets, traditionally eaten by hand, by rolling into small balls and dipping into your food. 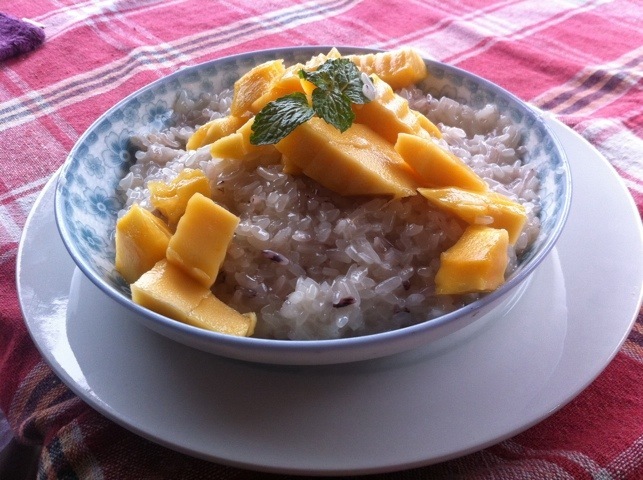 Sweet sticky rice (often billed as rice pudding) cooked in coconut milk supplemented with pumpkin, mango, banana or even chocolate can be a very tasty (and filling) breakfast or dessert. Laap is perhaps the definitive Lao dish, found in pretty much every restaurant. It consists of minced beef, pork, chicken or fish (although fish proved to be the elusive “Lao option”) cooked with chopped chillis, spring onions, fresh mint, fish sauce and lime juice served on a bed of lettuce. We only tried this once so it may vary from the following description, however our sampling of this speciality came in the form of a kind of steamed fish pie. The fish was blended with coconut milk, lime and chillis, moulded into a prism inside a banana leaf and steamed. The final product tastes much like a Thai curry, if somewhat more solid in texture. 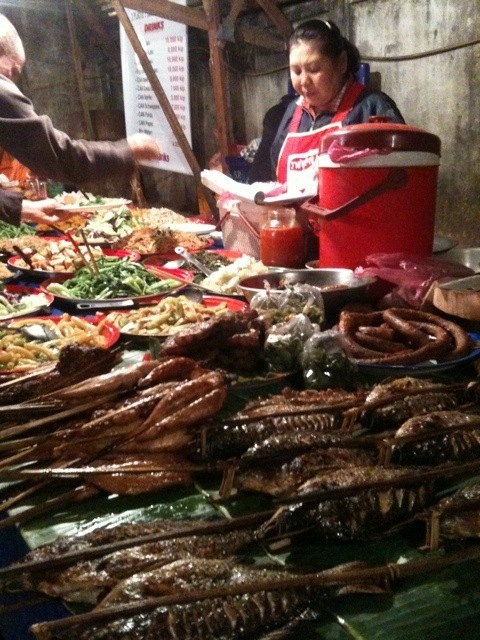 In Luang Prabang there is a fantastic street next to the Laos Heritage Hotel lined with stalls serving up a Lao buffet, all you can fit on one plate for 10,000 kip (80p, fish and meat extra). On offer are an array of vegetable and noodle dishes, curries, rice and battered deep fried chillis. For some protein you can choose from a variety of barbecued meats including ribs, chicken and elephant ear fish (from the Mekong) stuffed with lemon grass and grilled on a stick. 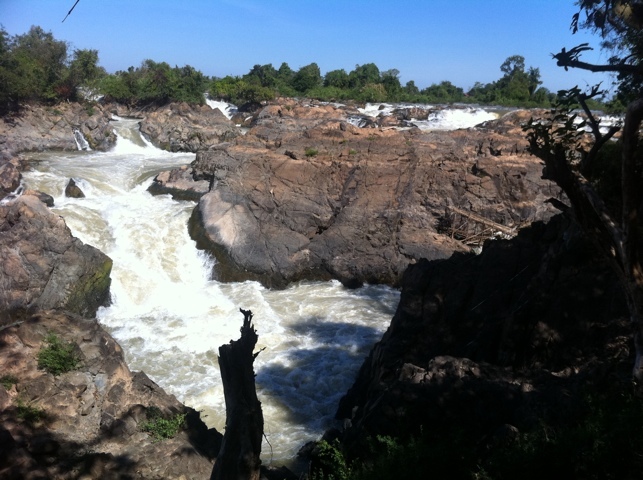 An excellent choice when you’ve blown your budget visiting the Tat Kuang Si waterfalls! Up until our recent visit to Laos I had thought that pumpkin was only good for two things: carving at Halloween and pumpkin pie. Laos has opened my mind to the versatility of this squash, supplying pumpkin curry, pumpkin burgers and pumpkin rice pudding, all very distinct but equally delicious! Lao barbecue appears to be a combination of the street barbecue and hot pots that we discovered in Vietnam. However, there’s a real sense of ceremony to barbecue in Laos beginning with the revealing of a hidden hole in the centre of the table. 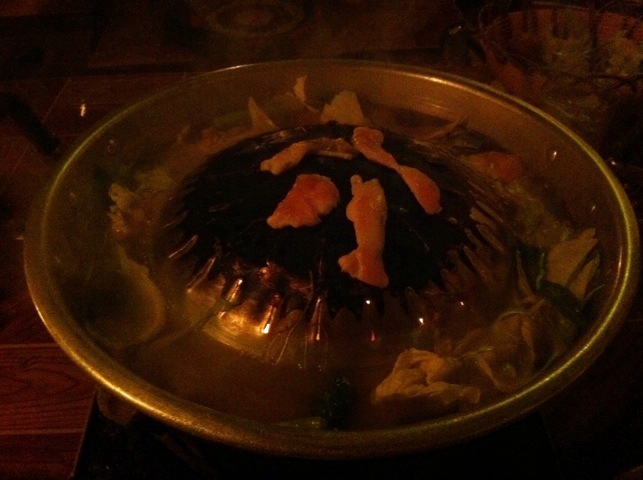 A bucket containing glowing coals is positioned into the hole with a dish approximating a metal sombrero placed on top. The middle of the “hat” (perhaps not as quite as pointy as a sombrero) is greased by wiping pork belly over the surface, strips of beef and chicken can then be laid on top and cooked. Meanwhile, a broth is ladled into the “brim” and loaded up with noodles and vegetables. The “barbecued” meat and soup can be seasoned with chopped chillis, garlic and lime and mixed with a spicy peanut dip before eating. This salad makes for a refreshing starter comprising grated papaya tossed with chilli and lime juice, with the occasional addition of cashew nuts. The papaya doesn’t bring much flavour but it’s a refreshingly crunchy and zingy dish nonetheless. 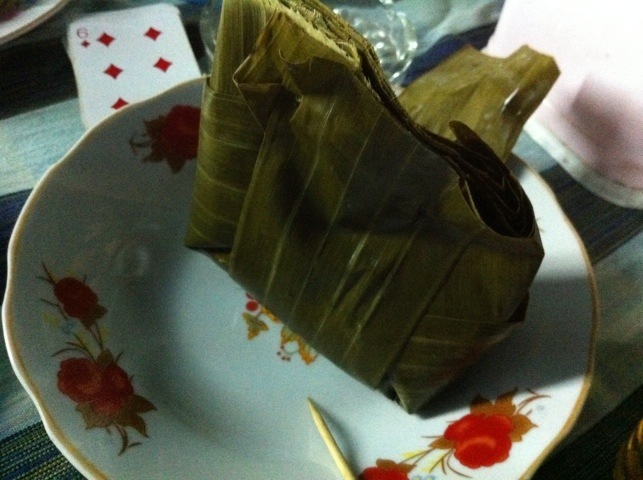 Ok, this isn’t a Lao specialty, but it was a very nice unexpected treat. In Luang Prabang we discovered a fantastic bakery called Joma who not only produce delicious cheddar and chilli bagels but also put us in a delightfully festive mood. 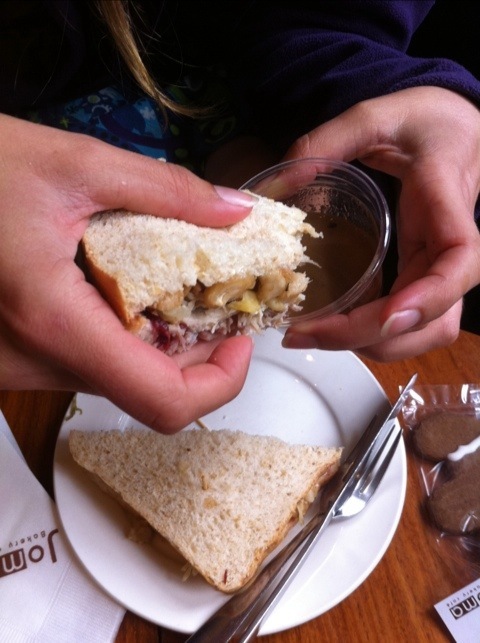 We cheerfully dipped our turkey, stuffing and cranberry sandwiches into little pots of gravy whilst humming along to ‘I’m dreaming of a white Christmas…’ with the sun beating down outside and Buddhist monks strolling by. 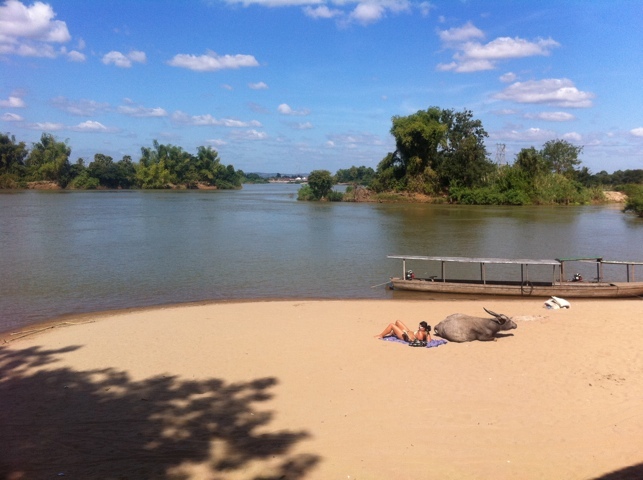 This Lao whiskey can make for some fantastic cocktails including Lao Lao mojito and piña colaolao, best enjoyed lolling in a hammock beside the lazy Mekong river. 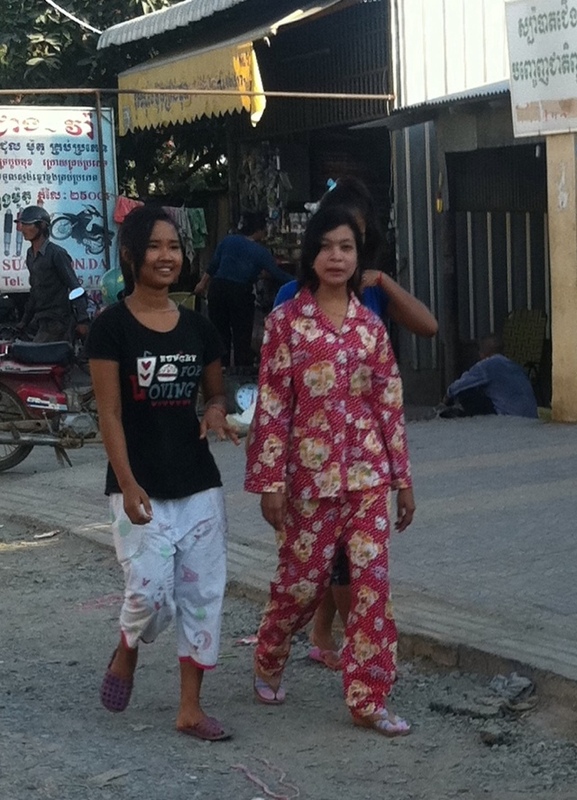 I’m writing this while in the bus station in Pakse, a dirty, dusty enclosure on the outskirts of town. We’re sitting on our bags on the grey concrete having arrived soon after dawn from Vientiane, now waiting for our onward transport to Si Phan Don, three hours away. The ground around us is spotted with oil marks from the passing vehicles, and there’s litter strewn across the dust; the sleeper bus that brought us here just departed on the return journey, but before it did, the driver kindly tipped out a basket of ticket stubs onto the mud, which have added to the mess. Around us, rickshaws come and go, as do motorcycles with sidecars (a new one for us), and the odd sparkling new car, all Ford Kias for some reason. The stalls around the perimeter are opening up for breakfast; the one next to us is serving steaming noodle soup, and there’s someone barbecuing meat in the distance. You can feel the day’s just getting started, following a familiar routine – the ice man comes round with a flatbed loaded with bags of frozen slush, shovelling them out into buckets for the stalls; a poor mother and her two sons wheel through their cart laden high with woven bamboo baskets each full of plastic to be recycled for a pittance; and a loudspeaker in the distance make some echoing propaganda claim about a candidate in the upcoming election before the music picks up again and relative laziness of Lao resumes. The bus last night was probably our craziest so far, its interior a sixties throwback of brown faux marble, studded multicoloured gemstone lights, and windows with a pink tassel fringe. It was certainly cosy too, with what were effectively small double bunk beds each side of the aisle, Laura and I having just one to share. The suspension didn’t exactly make it an easy ride, but we both appreciated having a fully flat bed, even if seatbelts and more room to move would have been a bonus! 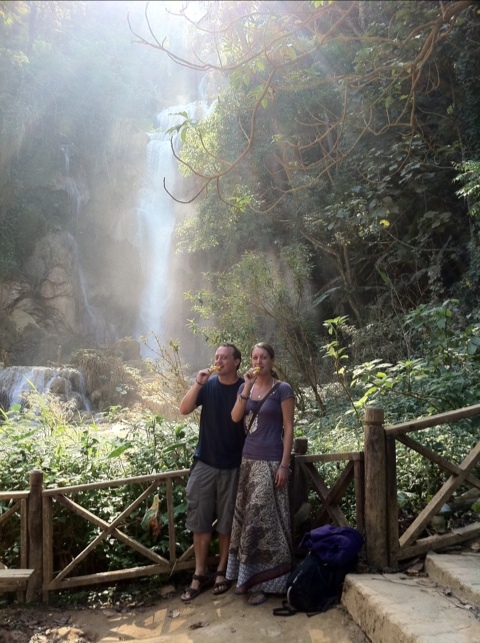 After Nong Khiaw, we stopped for a couple of days fun in the cultural playground that is Luang Prabang. 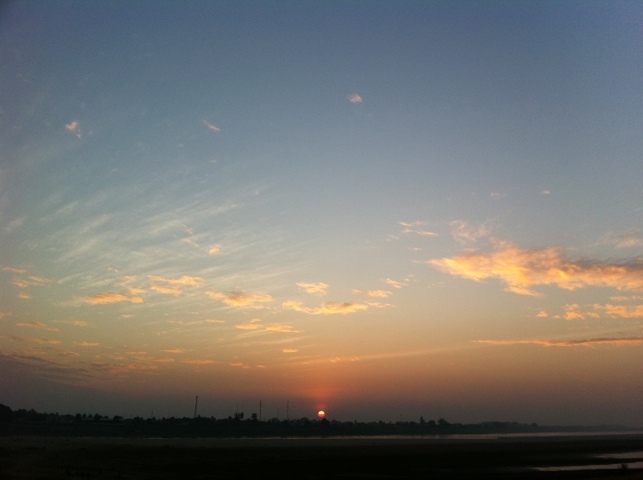 Quietly pottering between Wats and then soaking up the sunset is a great way to spend time. Each morning at dawn, monks pour out of their monasteries and down the streets for ‘alms giving’, an age-old tradition where locals line up to give each monk a small food offering, them making a religious contribution and the monks demonstrating that they are leading a devout life without possessions. The monks collect the alms in metal pots, eating the food when they return to the monastry. 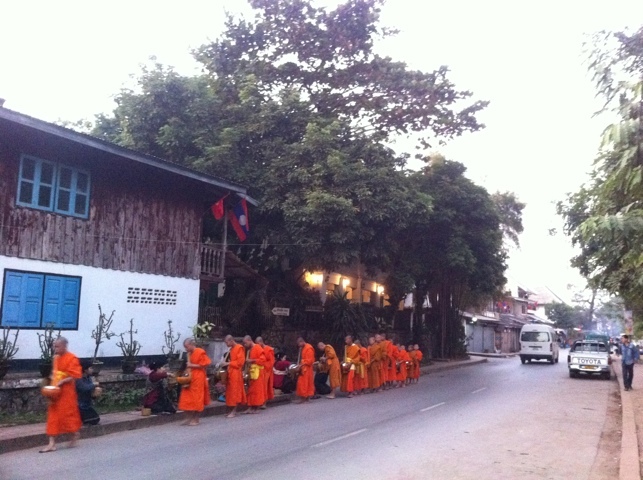 There are a lot of monasteries in town and so this is a big daily event, with the streets full of monks draped in bright orange, processing in groups down prearranged routes. However, I don’t think we’d quite prepared ourselves for what a tourist spectacle it has become, with the opportunity for a photo opportunity very much overriding the religious devotion. Our guidebook provides a stern warning not to participate unless you’re actually Buddhist, and then to be very respectful in what you do. Sadly this didn’t seem to have got through to a lot of tourists, many of whom had plenty of flesh showing and were buying cheap rice from the roadside stalls before queuing up to be photographed making a show offering. We’d read that in the past monks have protested against this pollution of their religious ceremony, but that the authorities had instructed them to continue as it’s an important tourist draw to the town, threatening that otherwise they’d be replaced with a false procession just for show. Who knows how true that is, but this is certainly the bad sort of tourism! 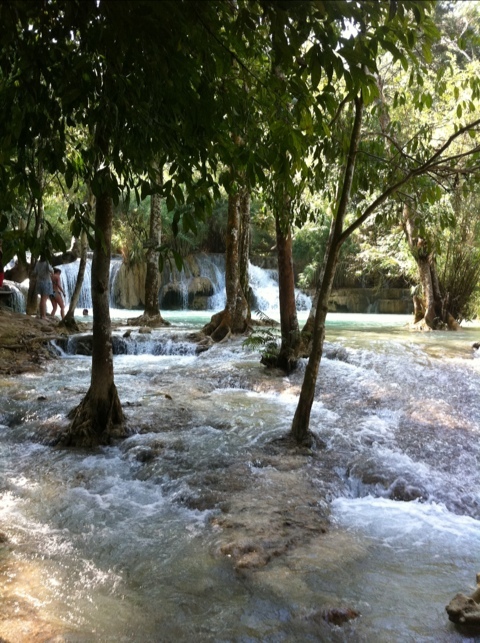 We also took a trip to the Tat Kuang Si falls, a truely tropical set of cascades and shimmering turquoise plunge pools. The beautiful sunshine re-emerged, and it felt like a glorious summer’s day back home, with the ice cold water refreshing if slightly shocking when we both went for a quick swim. The water was a brilliant shade of blue, and we had a peaceful ten minutes soaking up the atmosphere, and floating near the small rapids. The falls were home to crowds of picnicking locals as well as tourists and it felt like we were back in a National Trust park, although with one exotic addition – bears! There’s a bear sanctuary at the park in an effort to protect the local furry population from poachers. They had lovely outdoor enclosures and we watched from the viewing platform as a huge bear stood on his back feet and turned a drum with his front feet to extract food. 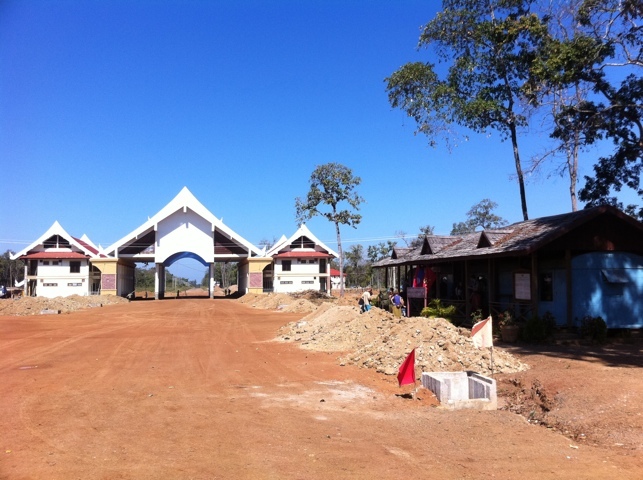 We stopped at a Hmomg minority village on the way back, a ‘village experience’ so customised for tourists that a well made concrete path led us on a route through the bamboo houses, lined on both sides with stalls staffed by local children selling handmade craft goods. Although we didn’t buy anything, we did spend a great 10 minutes afterwards playing with the kids, Laura spinning round with the girls clinging on to her arms, and me trying my hand (or more correctly, my feet) at Kataw, a hackie-sack keepie-upie game using a woven rattan ball which is as hard as it is hollow. Needless to say, my young instructor was a lot better than me, but I think they appreciated our enthusiasm! Having learnt the key moves, we thought it would be time to see how it’s done properly. 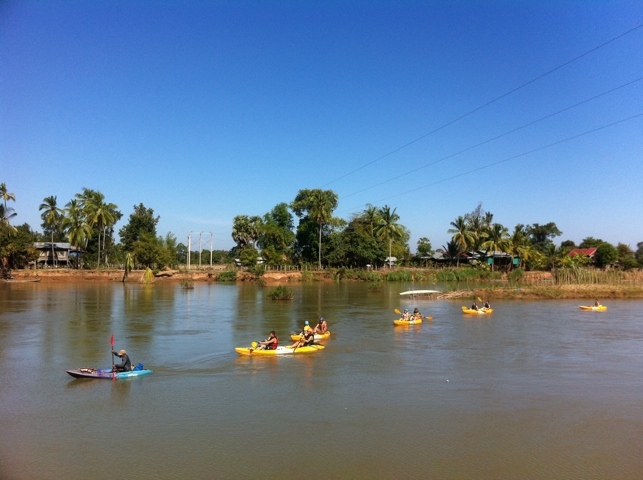 Luang Prabang is currently hosting the Laos National Games, a four-yearly competition in 25 different sports. We popped our heads into the Kataw venue and saw a couple of frantic matches, played a little like volleyball, but where only the feet and head can be used. Most spectacularly there’s a move involving the front player (it’s two-a-side) doing a forward somersault during which they kick the ball downwards on the other side of the net. I still need to do a little more practice before I master that one! We spent our final day hiring a couple of bikes and cycling around some of the sights further out. A real highlight was a visit to the weaving centre at OckPopTok, where they have a demonstration on how the complex patterns are made and what natural dyes are used. Unfortunately most of the weavers were out while we were there, so it was a bit of guesswork; reading up on how it’s done via Wikipedia is now on our to-do list! As we left town for Vientiane, fireworks were filling the sky, marking the opening ceremony for the Laos Games. It was an impressive display, all the more so for us as when it finished with deafening screamers and a huge finale of rockets we were in a rickshaw about 50m away from the ridge they were being launched from! Only seven months until the Olympics and London will be doing the same thing – although I’m guessing Kataw hasn’t made it the list of sports quite yet. Our boat for the journey up to Nong Khiaw. You can see the captain/mechanic trying to fix the propellor on the left. 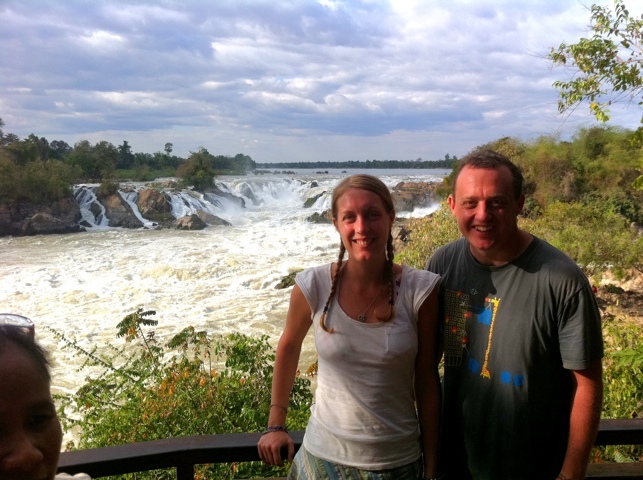 Eager to discover how Laos could possibly get any more sleepy than we’d found in Luang Prabang and Vientiane, we decided to take a break from it all and head upriver to the remote town of Muang Ngoi Neua. 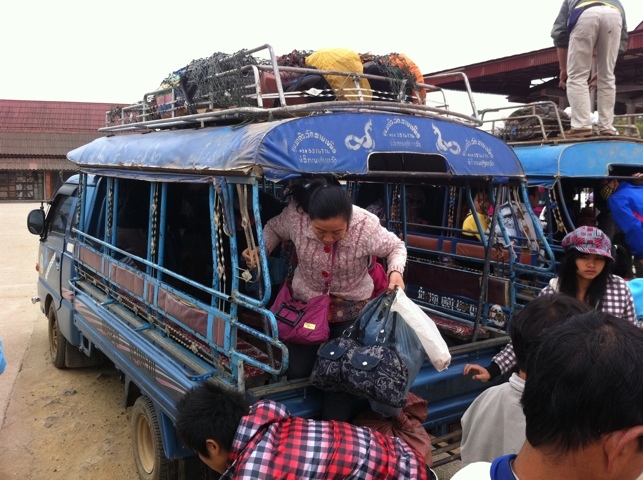 We’d been promised a memorable six hour journey to the intermediate town of Nong Khiaw, and it was certainly epic – in all senses of the word. The boat was shaped like a javelin, a craft about two metres wide and 15 long, with two rows of child-size wooden seats down each side and a dozen of us on board. And just like its javelin equivalent, it had no cushions. 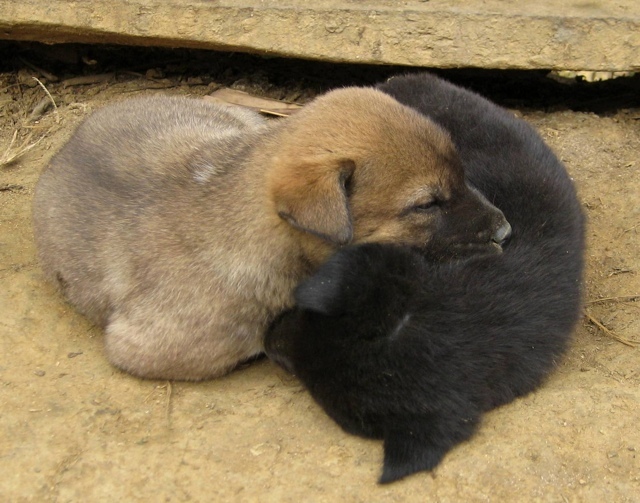 Six hours is a long time to be sitting on a tiny wooden stool with your knees pressed against your chest. It’s particularly long when it turns out the journey actually takes ten hours, travelling all morning, all afternoon, and arriving in the dark! Even if somewhat of a test of our endurance, the journey was stunning. As we headed upstream along the Mekong and then the Nam Ou rivers, we passed villagers with fishermen out on their narrow canoe-like boats, and towering karst limestone cliffs, which dominate the landscape. I’ve never really travelled a long way on a river before, but it’s interesting to see how much the surface changes as you travel along, from calm quiet waters one second to choppy rapids the next, presumably as the depth decreases, causing the water to run much faster. 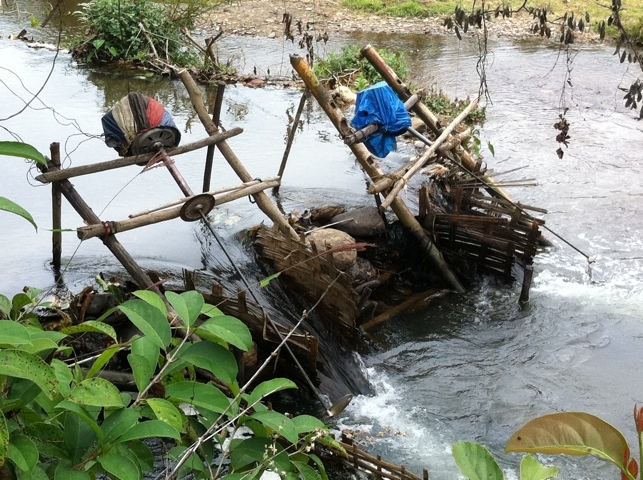 Although it’s dry season, we were surprised at the speed of the river, with the upstream journey at times an alarming struggle for our small boat. On a couple of occasions the river had narrowed and with the engine going at full throttle we were only just able to keep going forward, us shouting words of encouragement as the pilot tried to find the right line between the slower running water at the edge and not running us aground or into the overhanging greenery. We’d initially been hoping to make our onward journey the same day, but it became apparent that was not to be, as we soon had to stop for repairs to a broken propellor. After an hour of our captain turning mechanic and running around in just his underpants to everyone’s amusement, we set off again, with the delay meaning we were still going as the sun set and it got dark. Given the boat lacked lights, this was a bit more of a challenge, but we finally made it with the moon to guide us, in spite of the well-meaning attempts of an American woman who got her torch out and proceeded to accidentally shine it in the captain’s eyes, eliminating any night sight he’d picked up. We later found out that some delay befalls the boat every day – everyone we’d spoken to had a journey of at least 10 hours, so they’re quite used to it, although we’re not entirely sure why they don’t have a spare light just in case! 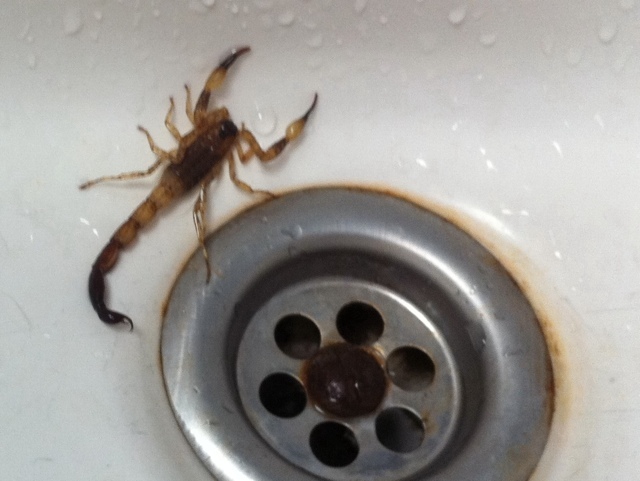 The scorpion in the sink. The plug hole was huge, honest! 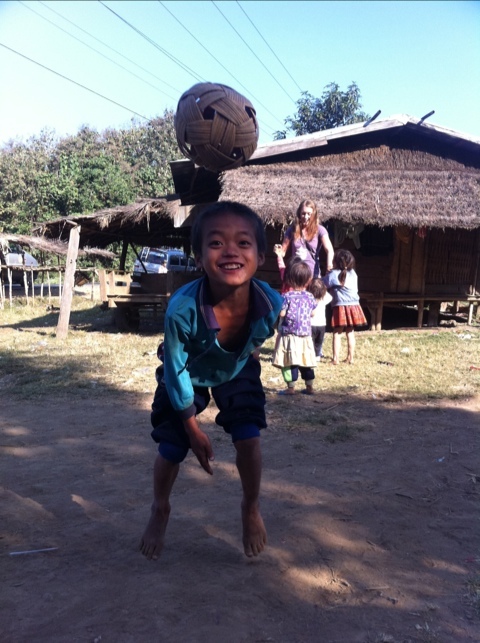 After a stopover in Nong Khiaw, we took a quick (well, 90 mins was quick compared to the previous day!) 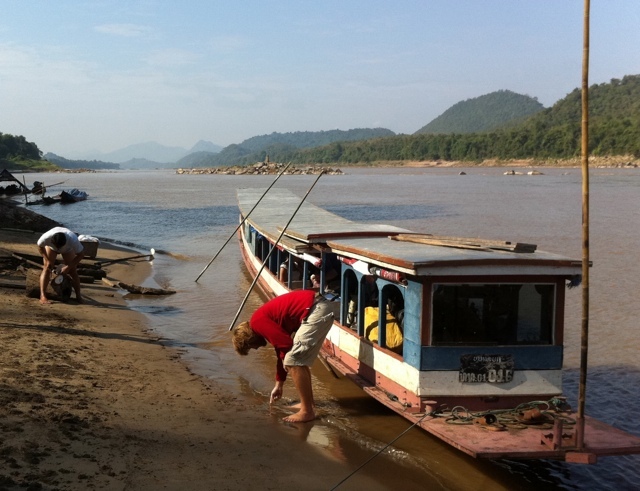 boat journey to the village of Muang Ngoi Neua. It’s brilliantly remote, with no mains electricity or roads, so you have to get there on water. Although not free of tourists – the one street is lined with guest houses – it was a great place to chill out and practice our hammock skills in idyllic rural surroundings. Most of the places are pretty rustic – small stilt bungalows with weaved bamboo walls and floorboards on the floor. On our first night, we found the place we were staying a little too rustic for our liking; we woke to find a small scorpion in the sink. We thought the thing was dead, an assumption that Laura to her horror discovered to be false while in the bathroom – with the door locked from the outside! Yes, I was the the one that locked that door (although with Laura’s agreement), and yes I did feel pretty bad about it! As we were scrabbling to set Dr Butler free from her scorpion prison, i suddenly remembered a less-than-helpful ‘fact’ I’d picked up from a recent Indiana Jones film – it’s the little scorpions that are the most deadly! Fortunately, it didn’t get her. Panic over, we quickly relocated to somewhere nicer on the riverfront, and we were a little more careful about wandering around barefoot after that! 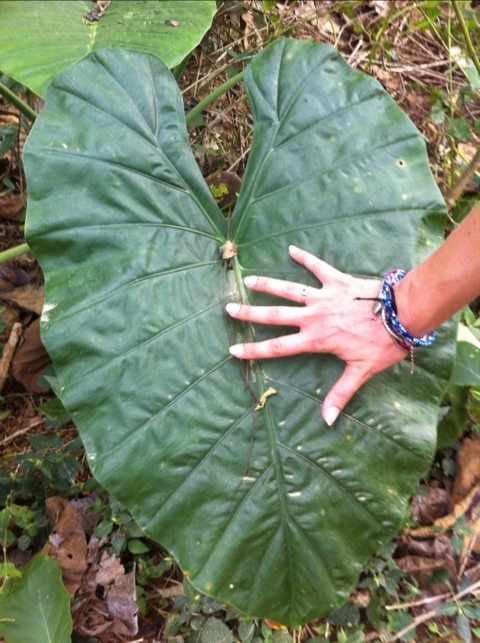 Huge leaves, or tiny hands? 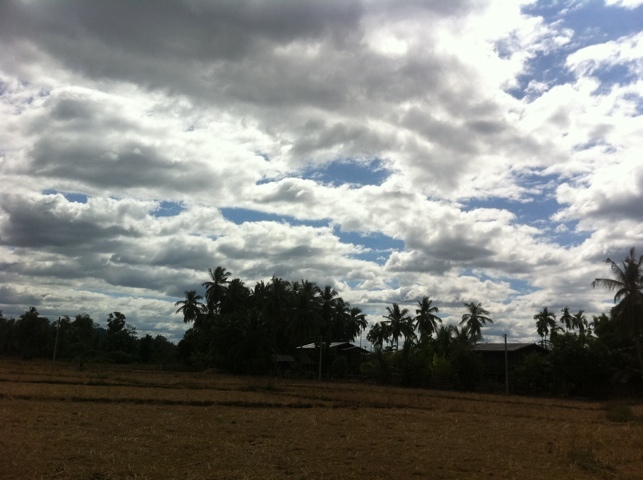 One day we went trekking to see some nearby villages. The trip took us through forests of green bamboo and lines of mysterious tall trees. You could for a moment believe this was a land of giants, with the greenery soaring to the sky above, and humongous leaves carpeting the floor below. Perhaps this is where those huge Buddha footprints came from? We plodded on through valleys of dry rice paddies, their wispy yellow stalks wavering in the wind like wheat, creating a beautiful picture against the sky and green mountains. The village we stopped in for lunch comprised entirely of bamboo stilt houses – in a design we’ve seen elsewhere in Laos, each wooden stilt of the house rests on a large boulder for foundations, making it look like the whole place could be shifted horizontally with a shove. We didn’t try! 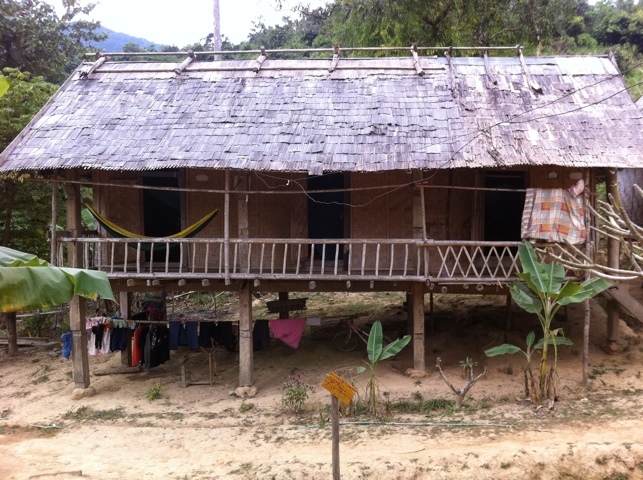 A stilt house in the village. Note the boulders under the stilts. Since there’s no electricity supply, people who need it rely either on diesel generators for a few hours a day (which is how they light the town we were staying in), or they use little dynamos suspended in the river nearby. We wandered across the paddies to take a look, following the telltale sign of the rustic-style electricity pylons, not great grey monstrosities, but instead sticks of bamboo with a bit of black bell wire running between them. Simple but effective! 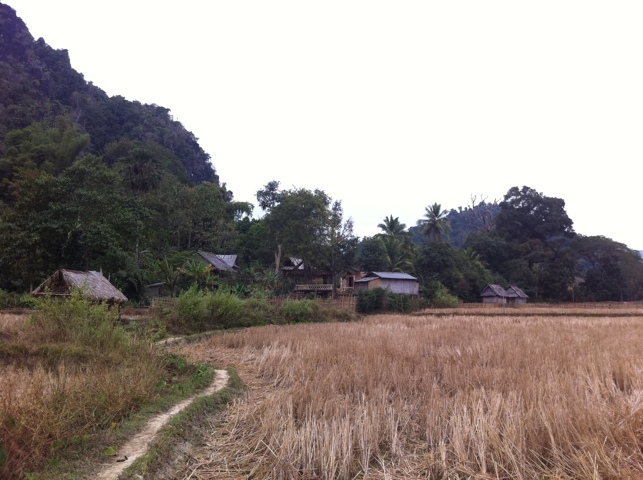 On the way back downstream, we stopped in Nong Khiaw to visit the local Than Pha Thok caves, home to the Luang Prabang provincial government during the war. Set high up and deep within the cliffs, the caves run for hundreds of metres, with areas for different sections of the administration. Next to the council chamber, there was a space labelled ‘Art Dept’; we had romantic visions of experts in oil and watercolour painting the scenes at war for posterity, until we realised that ‘art’ probably stood for ‘artillery’! Round the cliff, the two 10 year old guides we’d adopted took us to a second much more narrow opening, essentially a long tunnel running far into the rock, with chambers coming off it. With only our torches to light the way, we crawled through, not wanting to look too closely for the eight-legged inhabitants that were probably also enjoying the cool and dry inside. The space was used by the regional bank during the conflict, and it wasn’t hard to see why – the single narrow twisting passageway would have made it easy to defend, and there was plenty of space inside. It was claustrophobic enough though, and I can imagine it must have been pretty hellish during the war with bombers striking the hillside outside making everything shake. 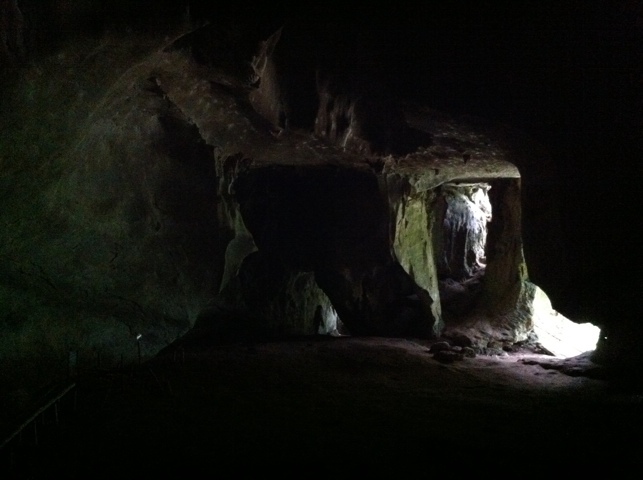 At one point, crouched on a rocky ledge, we switched off both our torches to see how dark it was, and our 10 year old assistants soon told us the answer through their squeals – scarily dark! 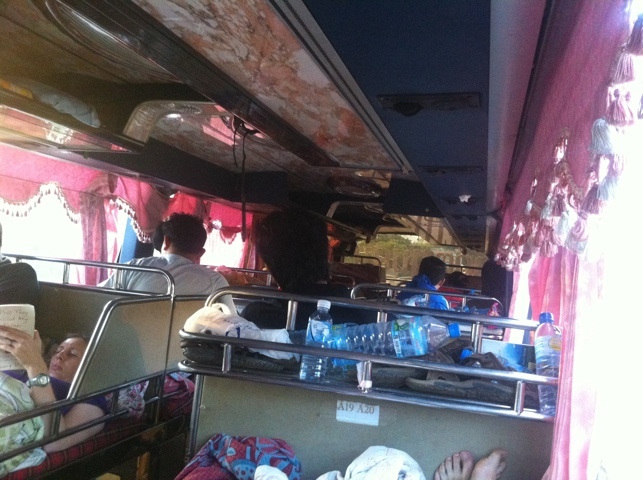 For the return journey to Luang Prabang we took the bus, a cramped three hour trip on a Sawngthaew. At one point, I counted 20 of us on the back, with 5 sacks of vegetables! With the wind rushing past us sitting on the open back of a pick-up and the lack of sun, we both actually felt cold for the first time in months. It reminded us that it is actually winter (I guess those back home might have noticed before now! ), and time for us to head south to warmer climes for Christmas. Our transport home, a sawngthaew. There were 20 of us in there!